25 wonderfully imaginative action songs for Early Years. Zappy Zebra, Zippety Mouse and Zee the Bee are the three main characters in this irresistible collection - and three finger puppets are included, to add to the fun! There is great variety of tempo, mood and rhythm, lots of sound effects to add colour, and plenty of simple actions to encourage children to engage in singing as a whole body exercise. Song themes link to EYFS learning goals: counting, colours, weather, transport, nature, seasons, animals, activities and much more. The book includes a teacher's chart indicating all these themes, and three colouring sheets as well as all the song words and music. Songs can be purchased and downloaded individually with lyrics and score in the 'SongZone' section of our website. One of the songs, 'Driving My Tractor', now has its own book and animation published by 'Barefoot Books'. View animation. "Absolutely fabulous - so child-centred. The words are easy to teach and learn, and the children love the CD backings." - S. Riley, Music Teacher, West Yorkshire. 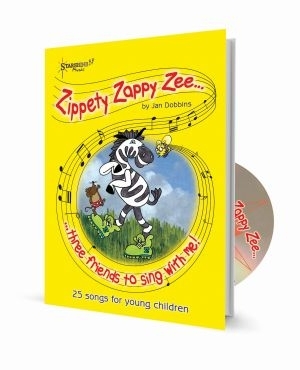 'Zippety Zappy Zee' is a 'visual' song package, including actions and puppets. The puppets provide the children with characters to enjoy and become involved with. This is a versatile selection of songs that can be used to support a variety of Early Years topic work. Review by Carole Jenner-timms - Head Of The Bnes Music Service. Fantastic sound tracks - ideal for enriching musical experience. Review by Julia Sloyan, Head Teacher, Somerset. These songs engage children and encourage active learning. Absolutely fabulous - so child-centred. The words are easy to teach and learn, and the children love the CD backings. Review by Alice Purkiss - Lecturer In Early Years (and Nursery Teacher) E. Sussex. A refreshing change from traditional children's songs. Lovely melodies that the children find easy to retain, and some great lyrics which fit well with topics like 'The Seaside' or 'Summer'. Altogether a delightful collection of songs. These songs are just so right ? imaginative and colourful sounds to share, with a variety of rich sensory experience. Review by Cara Langley, Mother Of Kayleigh 6 And Jake 3. Kayleigh thinks the tunes are beautiful. She liked the seaside sounds and Jake loved all the animal sounds and tractor noises.